Aside from his picking on Margaret Mead, Scott’s reasoning could attract a lot of Floridians; after all, both political parties have reduced their platforms to “Where are the jobs?” shoutfests, assuming that life will be hunky dory once Motorola starts interviewing conveyor-belt widget assemblers again. But if Scott thinks that state colleges should only offer free-market-friendly majors, he’s been sleeping in class. First, he ignores a host of recent research that shows college majors don’t matter as much in graduates’ long-term earning power as is often assumed. Second, “soft” subjects like anthropology (and philosophy, and history, and psychology, and English) serve their students pretty darn well: Take a look at the surprising list of notable Americans who majored in them… including Dubya, Carly Fiorina, Clarence Thomas, Billy Graham, and Ronald Reagan. You’d be hard-pressed to find a better marketer or brand specialist than an anthro major. None of that should matter, anyway. Is a degree’s intrinsic value really reducible to its marketability? Just a few blocks from the governor’s mansion, the Florida State University anthropology department—already ravaged by cuts and unable to admit new students—is fighting for its life by reminding visitors that anthropology is not only cost-effective and desirable on the job market, it’s morally satisfying, too. “The Anthropology Department educates students about the lack of biological support for the race concept and challenges the racist ideas that have led to inequality and exploitation,” the department’s website states. Hard to put a pricetag on a lesson like that. That, in the end, is perhaps why Scott’s really out to kill anthropology and the liberal arts: As opposed to conservative-friendly disciplines like economics and business management, liberal arts produce more culturally aware and progressive citizens, inclined to challenge ossified social conventions and injustices. Eliminate cultural and social sciences from public colleges, and you’ll ultimately produce fewer community organizers, poets, and critics; you’ll probably churn out more Rotarians, Junior Leaguers, and Republican donors. At the end of his radio spiel Monday, Scott said he was open to other folks’ ideas. “If anybody has any ideas where they see waste, they see fraud, they see any problems in where the state spends its money, let me know,” he told listeners. Well, Governor, you could start by paying as much for health insurance as your lowliest employees do. Or you could stop paying for unnecessary drug tests on the poorest and neediest Floridians. 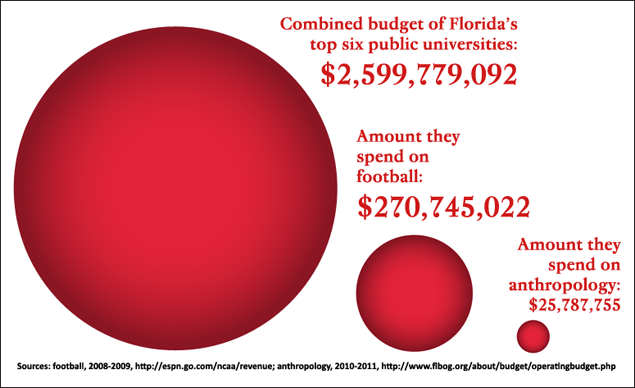 Or, if you really want to cut out waste from the state universities’ budgets, you could trim out some fat from their football programs instead of anthropology departments. I’ve illustrated the possibilities in the chart below.